The Leica multifunctional handgrip enables geotagging and permits the use of a separate flash unit when an accessory viewfinder is mounted. It has an SCA port that is similar to the sockets for external power supply and studio flash systems. It can easily be directly connected to a computer via USB. 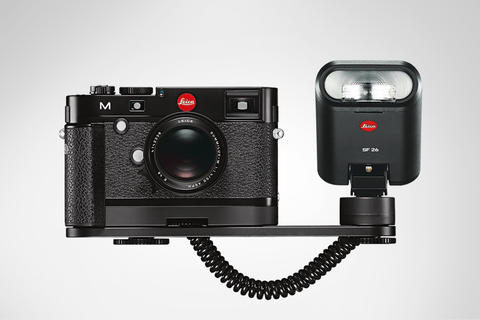 For permanent stationary operation of the camera in professional studios or industrial applications, the Leica M can be equipped with an AC adapter to supply the multifunctional handgrip directly from available power outlets. 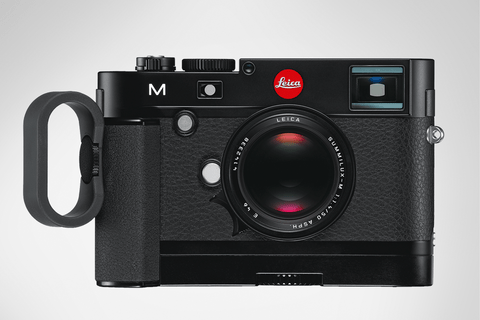 The optional Leica finger loop in various sizes (S, M and L) can enhance the safe and steady handling of the Leica M | M-P and its lenses. The loop can be used with either the Leica handgrip M or the Leica multifunctional handgrip M and can significantly improve camera handling when shooting – especially with heavier R-Lenses. The Leica SCA adapter set is used with the multifunctional handgrip. The multifunctional handgrip thereby expands the camera’s functional capabilities with an additional SCA-dedicated interface to allow the simultaneous use of a separate flash unit and an accessory viewfinder on the camera. The SCA adapter set – comprising a high-quality flash-bar and an off-camera hot shoe with a spiral cable – is required to use the additional interface. The SCA adapter set can either be used as an integrated unit to attach the flash unit to the camera, or without the flash-bar to allow off-camera flash.